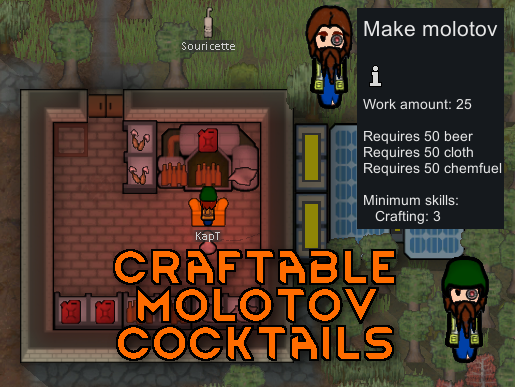 ﻿ [B18]K_K's minimods: Corrected Workgiver/Craftable Molotov/Fast growing grass/..
[B18]K_K's minimods: Corrected Workgiver/Craftable Molotov/Fast growing grass/..
Just craftable molotov Cocktails, nothing less, nothing more. Crafting them requires the research project "Refining" to be finished. And a minimum crafting skills of 3. - Re-introduce the old "Repair" work type, so now Construction and Repair are two different skills in the work-planner. - Moves harvesting work type into the plant cutting category so you can now prioritize harvesting over sowing. As a counterbalance, trees can "harvest fail". - Also contain a XML patches that makes "Stone Cutting" depending on the "Construction skill". Because "Stone Cutting" is giving XP in this skill. > Be cautious to plan your work priorities accordingly. > Note that now harvesting wood on tree can fail. Thanks to XeoNovaDan, it was while reading the code of "Plant Cutting is for Growers!" that I thought about that. CCCC! (SteamWS): Campfires Can Cremate Corpses! Movable Sandbags (SteamWS): because why not ? This mod came from this request on Reddit. i want this craftable personal shields mod! is there an a14e version? link? I might have to make a chinchilla "wool" mod now for mittens. edit: maybe you should mention it takes a month and has a value of 4, and put up some number of other wools to compare? As I just made it, release only start from A15, sorry. Thanks for the suggestion, I added a table with wool def values. that stuff is absolutely awesome. Maybe I am missing something but I cannot find the download for the personal shields. Is there a way to have the shields work with ranged weapons? I've been using the PersonalshieldMKII mod and it's not working on A15 for me. 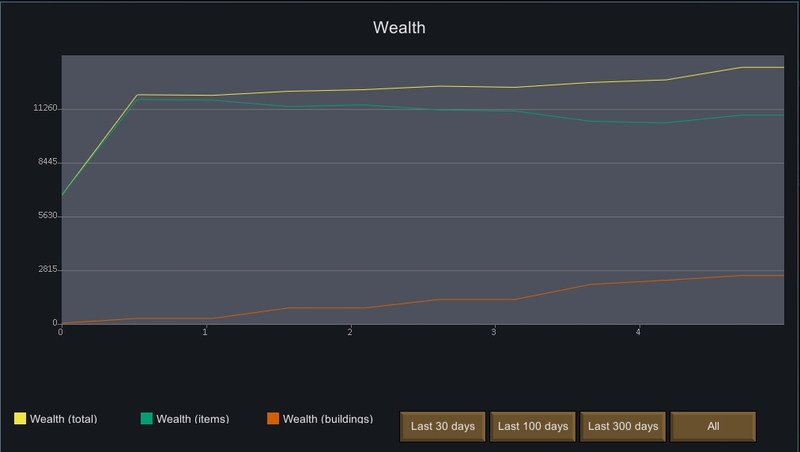 Can you tweak price of the thrumbo wool? It's pretty low for a resource with such stats. It's 7 times cheaper than thrumbofur, if I'm not mistaken.